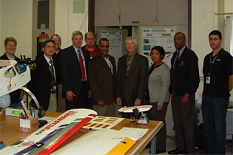 On Friday, October 16, 2009, the Morpheus Laboratory hosted Mr. John Miller, the Director of the U.S. Army Research Laboratory (ARL), which is the army?s premier laboratory for basic and applied research and analysis. Mr. Miller holds a both a bachelor's degree in aerospace engineering and a master's degree in mechanical engineering, from the University of Maryland. Mr. Miller joined Dr. James Hubbard?s Morpheus Team for lunch and a research overview briefing during his annual town hall visit with the Army employees located at NASA. The laboratory tour was also attended by Dr. Mark Nixon, Director of the Army Vehicle Technology Directorate. The Morpheus Laboratory is a part of the University of Maryland?s Army Collaborative Technology Alliance (CTA) Center on "Micosystem Mechanics? or CTA MAST Center on Microsystem Mechanics which was awarded on February 25, 2008. The total amount of the initial award to Maryland is $10M over 5-years with an option for another five years with additional award of $12.5M. The Morpheus Laboratory is developing active wing morphing technologies for agile flight under as well as a state of the art auto-pilot for flapping wing vehicles under the auspices of this center.